I was looking forward to last Sunday. Why? Coz of this. Sun Day Out indoor cycling at The School, Jaya One. 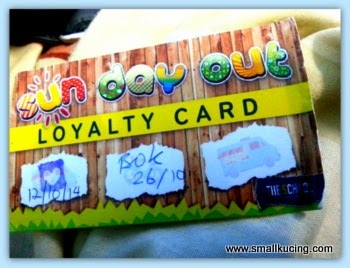 They have this Loyalty Card. each time you go..get one chop. Once you get 3 chop, you can redeem a Mystery Gift. We just got to know about this and last Sunday was the day we got the 3rd chop. Jeng! Jeng! ......My Mystery gift. 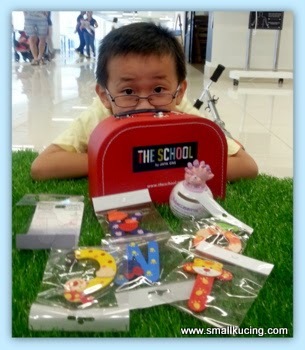 A lovely lunch box with a Dinosaur coin box and some alphabets in it. So cute!!!! Had great time "racing" with the kids there. Last Sunday they moved it up to the 1st Floor. Mamarazzi like it better coz there is a green area for her to rest her sore feet . Nice ambiance there. She can lay on the "grass" and read her books while I had fun there. All the playing sure had me famished. Mamarazzi too. Bought some food from the food truck out there. 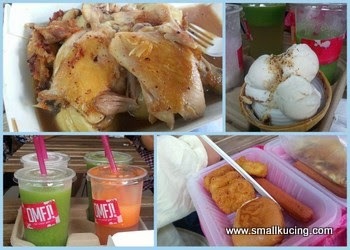 Top left : Chicken Comfit from Little Fat Duck Food Truck . Wokay...it looks not that nice but we tried it before and it tasted delicious. Hence nearly every week Mamarazzi would get this. Me and Papa likes their bolognese, carbonara and aglio alio with chicken or beef. Cheap at RM5 only. Top right : Cococnut Ice Cream from Sangkaya . Bottom Left : Healthy and good fruit juice from OMFJ! Food Truck. Can guess what OMFJ stands for? Bottom right : Hot Nugget Set from SpagMe Food Truck. I was puzzled and I asked the person handling the cash counter "why you ask people to 'spank' you?". Kena Mamarazzi and Papa laugh at me. Spag as in Spaghetti la...not spank. 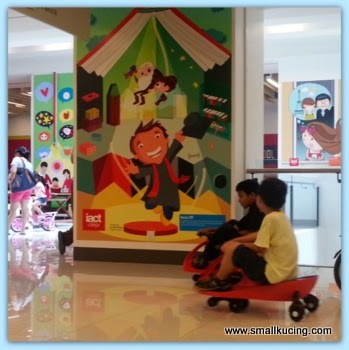 Next stop....Amcorp Mall to visit Mamarazzi's favourite bookstore. Aiyo....quite some time never come here here. 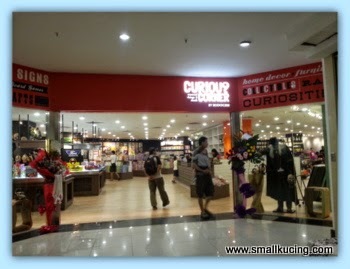 Was surprised that the tiny Curious Corner at BookXcess have grown up and moved to her own premises . No far. Just down the lane from BookXcess. Corner lot "bungalow" near the Korean Restaurant and Chinese Tea Shop. Goodness! Everything so neat and classy leh. Did not notice the pricing but surely price will be low lah. We drop by to say hello to a friend. The friend said this store just opened a few days ago. There was a story telling session ongoing by Ms Anne Ooi. Wish we could stay but time's up. Papa was waiting for us. Off we went. 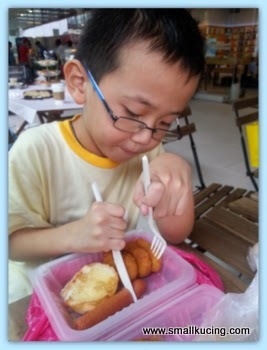 Hmmm....but I will try and bodek Mamarazzi to bring me there again soon. Saw some things that catches my eyes. So nice this kucing got mystery gift! Now no more cycling around the taman in front of the house? Oh My Fruit Juice? Looks like a fun place and event to join. Must find a time to go. Looks like so much fun!! And your mystery gift is really good! so many things! Even so much food, a great time for you both. Haha OMFJ sounds like 'something', if you know what I mean, if the last alphabet changed to G.. Haha.. okok, my bad, hehe..Wah that mystery box aka gift loot looks so nice, who doesnt like mini surprise? I like too..
G? duno leh...not OMG ? I wanna go Amcorp again my next trip to KL, Saturday afternoon for the flea market....and also for the nyonya food. You all can go for the books. you say say only la like SHaron. Dunno when u be coming. wow!! what a cool Sunday out.. so many activities and makan and shopping leh, Uncle SK read on also find it was a nice Sunday that Small Kucing had spent with Mamarazzi and Paparazzi leh.. LIKE!!! the food also got so many choices woh.. not just nasi lemak fried noodles.. but western ones like chicken confit, spaghetti and sausage with nuggets leh.. and RM5 is not expensive considering the location and food.. if normal food court already selling like RM15 leh.. ooopss, that was coconut ice cream!! blur Uncle SK thought those are pau, muahahaha..
yea.... food there mostly rm10 and below la. just few RM10 above. 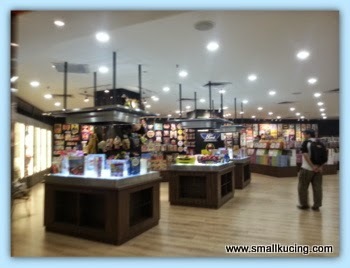 oh the little curious corner in BookXcess already moved out into their own shop ah?? walau eh, so big and so classy looking only!!! macam more grand than BookXcess itself leh.. hope they don't charge more expensive now..
yes...grow up liao lo...have own home. But still retains a small "room" at BookXcess la like all kids. Don;t think they will charge more expensive la. After all their tagline is read more for less...guess same got for Curious Corner. if in BX...it's at the right side of the entrance. Like the bag with the goodies. Your lunch box is so cute! The food trucks sell quite nice food and drinks. That's a nice mystery gift. So colourful too. So two malls in one day? :) I can only manage one! It seems like this little fat duck food truck is very famous? I haven't been to JayaOne for such a long time. JayaOne use to be my hangout place. That is a pretty snazzy lunch box you got there. The red suitcase not suitable for Small Kucing, can give to a little girl like....Sam? haha!